Quadruple India considers costumer reviews as a word-of-mouth feedback for building a favorable image for the organization. We at Quadruple, insist in realizing the sense of confidence in prospect and ensure lead conversion. We see negative feedbacks as a mirror that reflects flaws, thus we work our way to get rid of them. We ensure that our customer’s voices are heard, whether it is an appreciation or denunciation of our product or service, which is why we have a complaint and review page where one can express what they feel about us. 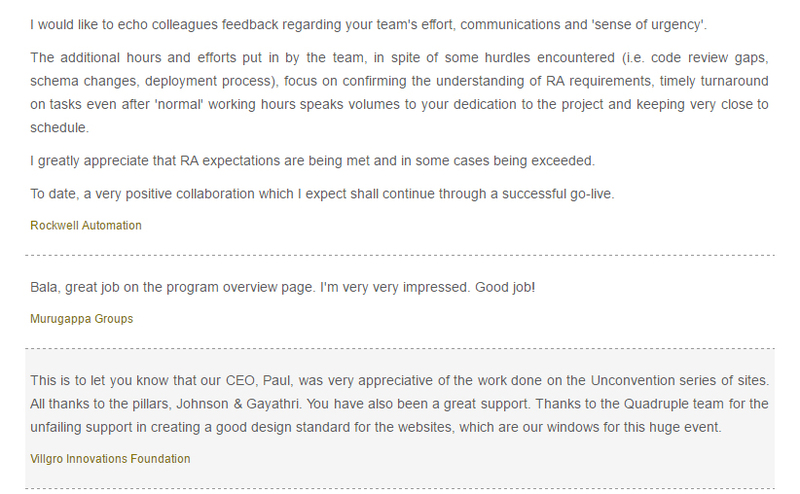 However many of our happy customers and corporate partners have shared their Testimonials for us. Thanks to them! Here’s some our testimonials we thought of sharing on our blog. If you consider writing us a review or complaint, we make sure you get a timely response as soon as we hear you. We also remember to deliver excellent service to resolve the issue that is alerted ASAP. It is our business goal to stay calm, and find a solution. We take efforts to manage and solve the problems such that the same issue doesn’t turn up again.